Yoga is more than a trendy activity, its positive benefits reaching beyond just relaxation. Yoga’s peaceful approach to fitness does wonders not just for the body, but for the mind as well. While there are many who thrive from intense workouts and continuous reps, yoga practices patience and acceptance as you slowly build muscle and flexibility over time. 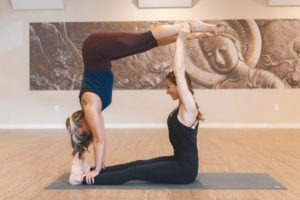 There is no better place to find Yoga in the Houston Heights than at O Athletik. Yoga, however, is not to be underestimated. At O Athletik, we value goal-setting and improvement. Whatever we do, we never stagnate. Yoga is a journey of improvement. Whether you are just starting out or you have been practicing for years, there is a spot for everyone on this journey. In addition to mental health benefits, yoga is great for people searching for low-impact exercise, either because of an injury or other problems. For those with posture problems, yoga is an excellent avenue to help align the back and strengthen the core muscles that help with proper posture. On your first day of class, you may not be able to do every move that the instructor does, or you may not be able to do it perfectly. However, over time through persistence and patience, you will start to see that your body is learning to perfect the moves you have been practicing. This is what makes yoga such a rewarding experience, allowing yourself to improve and overcome, until one day you look in the mirror and realize you are holding a perfect pose. Depending on the intensity of the workout and the weight of the person exercising, yoga-goers can expect to burn anywhere from 200 to 600 calories per hour. The more you weigh, the more calories you can burn. To better understand your body and its needs, you can visit the homepage to calculate your BMI. They say that it takes on average 10,000 hours for one to become a master at something. However, yoga is a personal journey, and mastering it is only one of many goals that one can define for themselves. A person who is “good” at yoga may not be the most flexible, but the most willing to learn or the most improved. Unlike competitive sports or more intense outlets, yoga is not about beating records, but gradual improvement and self-acceptance. Interested in joining us in one of our yoga classes? Check out our class schedule and find a time that works for you! We offer classes ranging from beginner to more advanced, including Barre Fit, Vinyasa Flow, Yoga-ssentials and more! If you are new to yoga, we recommend you check out our Yoga-ssentials class, which caters to all levels and is designed to cover the fundamentals of yoga, focusing on alignment and strengthening. For a more intense workout, our Hot Vinyasa class steps up the game, taking place within a heated room (95-105 degrees). This type of yoga is athletic-based and is a great class to improve your flexibility, help with recovery, and highly decrease your chance of injury.